When I moved back to Los Angeles in June the hot new restaurant I constantly heard about was Wurstküche. Being a Westside snob rarely crossing the 405 on the weekend, I kept putting off the drive to downtown Los Angeles for exotic sausages, Belgian fries and beer. Wurstküche is worth the hype, serving rattlesnake, alligator and duck sausages for the adventurous, as well as your more traditional bratwurst and hot italian for those wanting to keep it simple. All sausages are served on a yummy fresh roll, and topped with your choice of sweet peppers, caramelized onions, spicy peppers, or sauerkraut. In my three visits I have sampled the Mango Jalapeño, Sun Dried Tomato and Mozzarella, Alligator and Pork Andouille, and my favorite, the buttery, spicy, delicious Rattlesnake and Rabbit with Jalapeño. Not only are the sausages super tasty, the fries are ahhhhh AMAZING! Double dipped Belgian fries are served with your choice of tasty dipping sauces (our favorite is the Chipotle Aioli). The fries are thick and crunchy, but soft on the inside. Wurstküche also offers a huge variety of beer, and their bar tenders have the expertise to find you something to suit your individual beer requests. Last night while celebrating Alaina’s 26th birthday I tried the Franziskaner, which was both fun to say and sip! 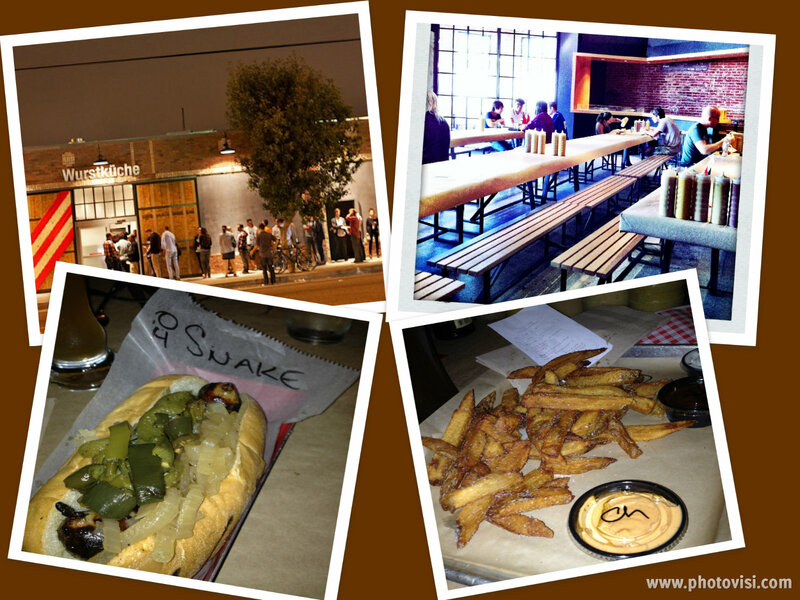 If you live in LA and you have not been to Wurstküche yet, go now! If you visiting from out of town, add it to your agenda. You won’t be disappointed. I loved the downtown one! It is near and dear to my heart (and Mos's).